After I have finished my year at the Daylesford B&B "Old Chilli", Shane and I are intending to travel around Australia in a campervan. So as today was such a lovely day we thought we would go and do a bit of window shopping. 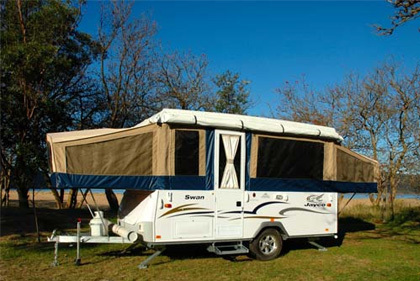 In an ideal world I would really like to purchase a brand new "Jayco Swan", but if we came along a good second hand one at the right price that would be great, because they aren't cheap. So to help things along I already have a picture of what I want on my "Vision Board" and I figure if I put my intention out there maybe my "Guides", "Angels" and anyone looking after me will help me along. This reminds me of when I was in my youth, my mom purchased something similar to this and she'd pack up four girls and off we'd go. I think that this is much more appropriate for two people, not 5 and from what I recall, they are rather comfy to sleep in. Much better than tenting that's for sure! Road Trip!!!! Sounds like a blast. Darlene - Yes I'm sure I could handle 5 people in a camper - it should be fun. I am so looking forward to my year in Daylesford and it's only 1 1/2 hrs from home so I can float between the two. Joanna - Yeah the road trip should be fun. Should make for some good blog posts.